I’m always inspired by Spain which was one of the reasons I couldn’t wait to get my teeth into this beautiful book telling the story of one of the country’s most important products – Sherry. I had no idea what a huge subject it was and all lyrically explained here by author Talia Baiocchi whose love for this much misunderstood beverage and its history came shining through. Sherry is a fortified wine that is aged in above-ground cellars called bodegas and includes in its spectrum the sweetest and driest wines in the world. How’s that for confusing? Jerez de la Frontera, Sanlucar de Barrameda and El Puerto de Santa Maria in Andalusia form the 11,000 hectare Marco de Jerez where it is produced – otherwise known as the Sherry Triangle. And having taken a backseat for decades in the world of wine, its popularity is now hugely on the up. 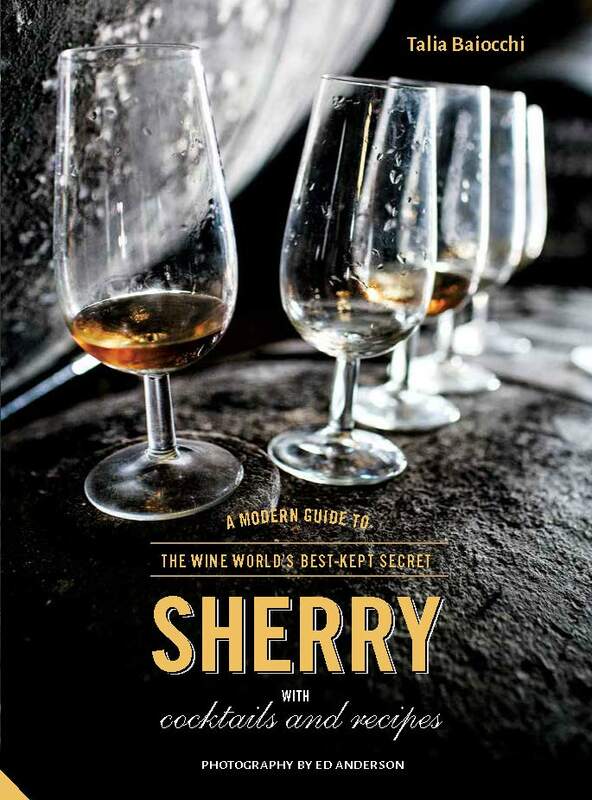 The book takes you through the history, different types, how it’s made and a tour through the sherry region, including detailed descriptions of all the bodegas to visit. Now there’s a good route to base my next holiday itinerary on. It’s a fascinating tale and then of course there’s the sherry itself. My first taste of sherry was as an 18-year-old student in South Africa, sitting around the campfire playing drinking games with OB’s (Old Brown Sherry). It was sickly sweet, alcoholic and, most importantly (for us students) cheap. Oh and caused horrendous hangovers all round! I think everyone has their dodgy sherry story but that is not what the stunning sherries of Spain are about. The total opposite, in fact. They taste surprisingly good and are extremely versatile, so go surprisingly well with a wide range of food. And there are a surprising amount of them. Well, I was surprised anyway. And they’re also fantastic for making cocktails and to cook with. The book includes sections on these, too and I tested out several of the recipes. 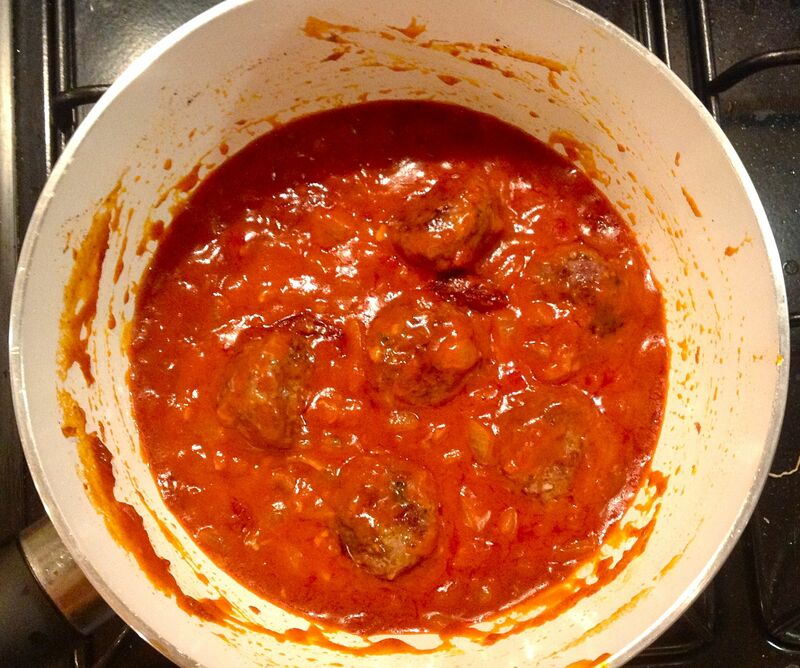 One of my favourite Spanish dishes is albondigas – tasty little meatballs served in a vibrant, silky sauce. I’ve eaten it many, many times and cooked several versions of it myself, too. But this one is the best one ever, the sauce is quick and easy to make and tastes heavenly. It’s a real wow dish, so I had to share the recipe with you. Combine all the meatball ingredients, except the olive oil in a bowl and mix thoroughly. Prepare a baking sheet covered with baking parchment. Shape the meat mixture into 18-20 meatballs the size of golf balls, placing them on the prepared sheet as you shape them. In a large frying pan, heat the olive oil over medium-high heat. Add the meatballs to the pan in batches and brown all over to create a crust – about 6 mins. Remove and place them on a plate lined with kitchen paper to soak up the excess oil while you make the sauce. In a medium pan over medium heat, heat 2 tbsps of the olive oil. Add the onion and garlic and sweat until they are translucent, about 5 mins. Add the paprika, flour and remaining 2 tbsps olive oil and stir well to combine. Let it simmer for 2 mins, the sauce should have the consistency of a roux. Stir in the sherry and the chicken stock and bring to a simmer, then turn the heat to low and simmer for 10 mins. Season with salt to taste. Add the meatballs and stir gently to coat them in the sauce. Cook for a further 10 mins over a low heat, adjusting the heat to maintain a rolling simmer. If the sauce gets too dry, stir in a bit more chicken stock. Serve with cocktail sticks for spearing as a tapas dish or with vegetables as a complete meal. I loved this book, it’s comprehensive, entertaining, extremely informative and captures both sherry and the spirit of Spain so perfectly I wanted to head straight for the airport! And the photography is beautiful, too. Bring on some sherry-based trips, I say, oh and I really must try out some of those cocktails, too. As a reader of EatingCoventGarden you can get your very own copy for a special price. To orderSherry at the discounted price of £16 including p&p* (RRP £20), telephone 01903 828503 or email mailorders@lbsltd.co.uk and quote the offer code APG347. *UK only, please add £2.50 if ordering from overseas. Recipe extracted from Sherry: A Modern Guide to the Wine World’s Best-Kept Secret, with Cocktails and Recipes by Talia Baiocchi. Photography by Ed Anderson. Published by Jacqui Small (£20).